Hi there! Welcome back to the blog. 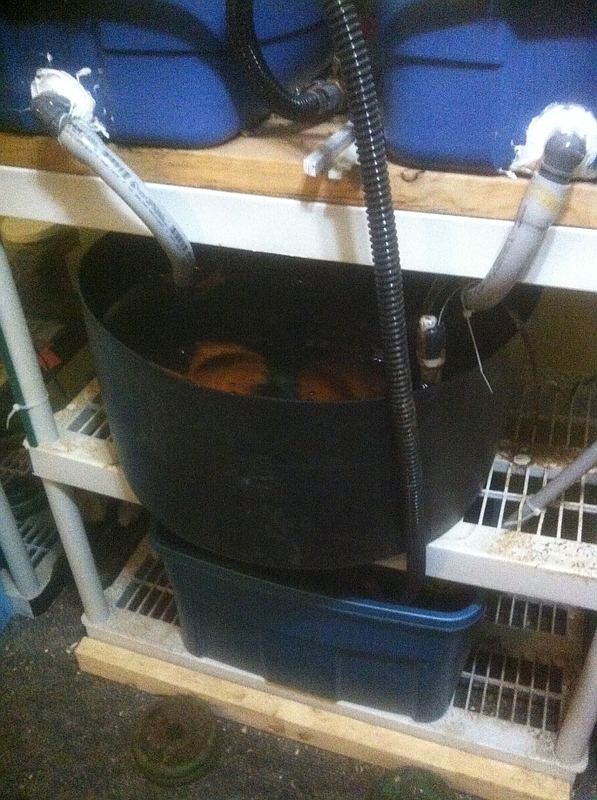 Back in September 24, 2013 I wrote about the “basement scale” Aquaponics system that I built. It’s been a pleasant success in proving the concept. The fish are in excellent health with no mishaps at all, and there is an abundance of green that grows at a surprising rate. There have been some interesting things I’ve figured out along the way, observations I’ve made, as well as a major change. So, I’m going to talk about that first, so that anyone following behind me doesn’t make the same mistakes. Firstly, the fish “tank” made from one of the plastic totes has been replaced. The problem was that while the idea of the design was that the water-level would remain constant, in practice, it never was. 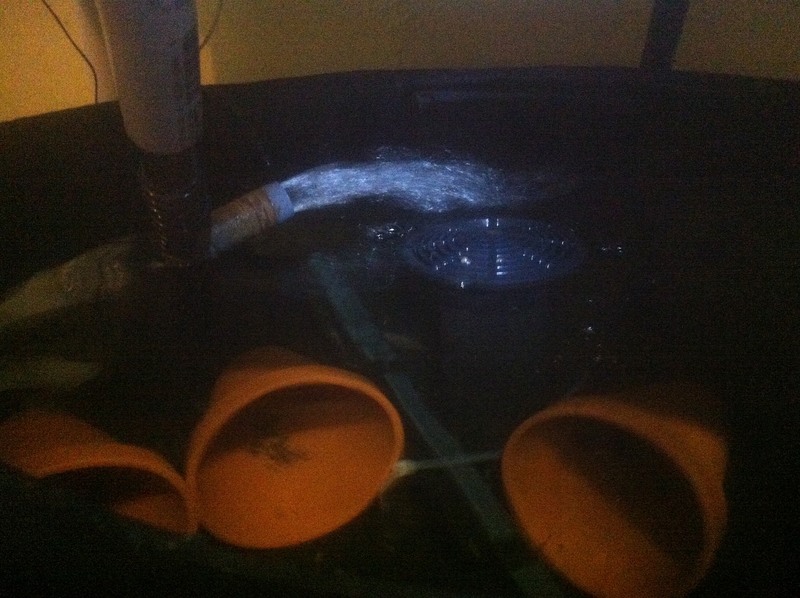 As the two grow beds above would auto-siphon, up to an additional 14L (3.7 US Gal) of water would get dumped in, adding up to 15mm to the water depth (0.6 inch). This would cause the thin plastic of the bin to flex outwards under the weight change, and then back in as the water drained down. The siphon runs every five minutes, or thereabouts. In the more than 9 months the system has been running, that means that the plastic has been flexed and unflexed about 2600 times. The high-water drain holes were getting deformed and were leaking around the gasketed pipe fits. Even silicone caulking simply gave up and required redoing twice in the past four months. The grow beds themselves are working well. Since the real mass there is the gravel and charcoal, those plastic bins don’t flex. Or, if they do, its on such a small scale that it’s not causing issues (yet). So the fish tank had to be replaced. What we did was completely change the way it worked. 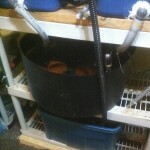 We replaced the plastic tote with the bottom third of an 208 L (55 US Gal) ABS plastic barrel. We drilled a hole in the bottom center, and used a 50 mm (2″) Uniseal to fit a piece of pipe up with a low-profile 100 mm (4″) drain cap on top. The water depth is 22.5 cm (9 inches). The bottom of the pipe goes through a hole cut in the shelf, straight into the sump below. Firstly, the ABS plastic is much more rigid. This means that even if water “piles up” in the fish tank, there is no way the plastic is going to flex. Secondly, the drain is through the bottom, which avoids the issue about the sides flexing anyway. Lastly, the single 50mm pipe drains four times as much water per second as the original two hose drains did. This has led to some nice side effects. Firstly, the fish are more active. Due to the round shape of the fish tank, versus the angles of the auto-siphon pipes from above, the water in the tank flows in a clockwise direction. While the water speed picks up when one or both of the grow beds are draining, the effect is a constant “stream”. With the rectangular bin, there was a remarkable amount of turbulence generated instead. The water did not flow around, so much as get shoved around, with the fish in it. Now, because of the much less turbulent flow of water, the fish are seen swimming around, playing under the outfalls of the grow bed auto-siphons, and being much quicker to the surface for food. All of that points to a much better habitat for the fish. That’s it for this post. In the next one, I’ll talk about the need to read about what your planting before you plant, some of the trip-ups with pepper plants, and the dangers of removing adult plants from your system. 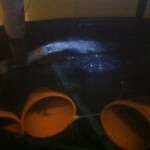 This entry was posted in 21c Homestead, Aquaponics and tagged Aquaponics, DIY by MichelV69. Bookmark the permalink.